During my freshman year of college, there was a young man in my dorm whose mother would do his laundry for him whenever she came to visit. While this beleaguered mother did not plan on being her son's part-time laundry service, she was so horrified by the state of his unwashed clothes that she felt like she had to do his laundry for him. Considering the fact that she only visited a couple of times over the course of that academic year, I can sympathize with her horror, if not her actions. While I was a step or two above this young man in terms of laundry skills, I still made some errors that cost me on occasion — like the time I accidentally bleached holes right through a shirt, or when I shrunk wool sweaters. That's because knowing how to wash clothes is not a skill taught in school. It's one of many life skills that parents need to teach their kids to help prepare them for the adult world. Your kids need you to teach them the following life skills so that they are not caught by surprise once they reach adulthood — and you are never stuck laundering the clothes of a capable young adult. It can feel very difficult to teach someone else how to budget if you struggle with money yourself. But you don't have to have a black belt in budgeting to be able to teach your children. Here are some steps you can take to help them master money. Allow your young kids to make financial mistakes while the stakes are still low. For instance, if your child spends all of their money on a toy when they'll be going to the carnival later, do not give them more money to spend at the carnival. Let your child recognize that once money is spent, it's gone. Failure is an important component of success, since no one achieves their goals without experiencing setbacks. Unfortunately, schools are set up so that failure is seen as a terrible outcome, and the way that failure is talked about in our society can make kids (and adults) believe that they need to avoid failure at all costs. This leads to kids and adults who give up when they feel frustrated and are afraid to take risks. To teach your kids how to fail, emphasize to them that there are lessons to be learned from failure. After your child experiences a setback or a failure, ask what they learned from it. Making eye contact when talking or shaking hands with someone. Apologizing sincerely and accepting responsibility when you are wrong. Knowing how to politely phrase requests and respond to questions. Many adults struggle with time management because they were never explicitly taught how to arrange their time and schedule. And though there is no one way to handle time management, there are some underlying principles you can teach your children to help them develop their own method of time management. Routines can help kids understand when things are supposed to happen every day, which can give them the tools to create their own routines and have less unstructured time to manage. Use timers during chores and other tasks to teach this principle so your children learn how long various blocks of time are, which will make it easier for them to anticipate how long things will take. Creating a family calendar together can help your child see how planning can make events run more smoothly. When you don't have any cooking skills, then you are stuck spending more money than you need to on convenience foods and restaurant meals. Your kids need to be able to feed themselves when they are adults, which includes knowing how to buy and prepare basic meals. When I taught high school English, I was always amazed by the number of parents who would call me to discuss their children's grades. While I could understand why parents were concerned, the student's grade was between the student and myself. Every time a parent tried to cut the student out of that conversation, the parent made it clear through their actions that they thought their child was not competent. Kids need to learn how to be their own advocates so they can handle conflicts with authority figures in adulthood. To teach your children this important skill, allow them to speak for themselves as early as possible. Start by letting them order their own meal at a restaurant. When your child does need to talk to a teacher, practice with them beforehand and don't succumb to the temptation to do it on their behalf. The best way to teach your kids how to clean and maintain a home is to have them help you as you complete household chores. When your kids are very little, they want to help you, and you should let them, even though you could get it done more quickly by yourself. Explain what you are doing and why, so that your kids have a baseline understanding of how everything works within your home. As they grow, have them take over chores around the house — including doing their own laundry. Ahem. Preparing your child for adulthood is no easy feat. But recognizing which skills your child will need can help you figure out the best way to introduce those skills. 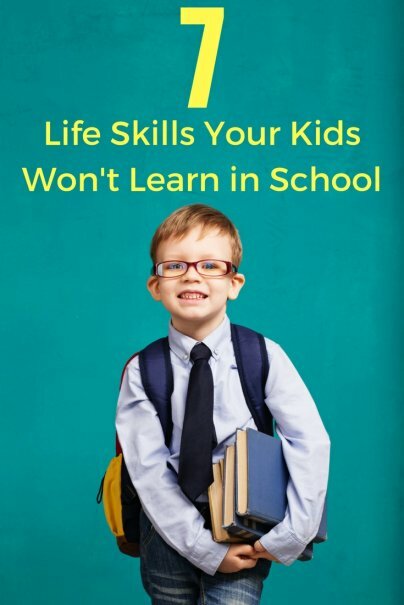 Not only will teaching your child these skills help her to feel confident, capable, and ready to take on the world, but it will also keep you from having to do their laundry in adulthood.